I'd like to announce that after a long hiatus from blogging, I'm taking it up again in a new forum. The new blog, Transfer Pricing Economics, is primarily devoted to exploring my particular area of professional specialty, namely "transfer pricing". If that term doesn't mean anything to you, then feel free to check out my brief explanation of transfer pricing. My aim is to expose and analyze the connections between the arcane world of transfer pricing and broader developments in the economic and financial world. And the connections are significant: the rules and economic logic of transfer pricing have a direct impact on trillions of dollars of international trade every year. So please feel free to check in on and contribute to the discussions about these issues that governments, tax authorities, economists, and transfer pricing professionals wrestle with every day. To me, the central issue raised by this week's Cyprus debacle is how it has affected confidence across the eurozone. To what degree has the possibility of insured depositors at a eurozone bank losing a portion of their deposits affected the mindset of depositors? To what degree has ECB acquiescence to this possibility undermined the notion that deposit insurance in the eurozone means the same thing in all countries? And to what degree has the ECB's direct threat to end support for Cyprus's banking system in the event that the government of Cyprus can not arrange sufficient funds to meet its conditions made a farce of its earlier promise to "do whatever it takes to preserve the euro"? These, to me, are the interesting questions prompted by this week's events. And while no one can definitively say that they know the answers to these questions, the answers will likely have a very direct bearing on the future of the eurozone. It's a pity that we need to ask them at all -- if things had been handled better in Brussels, Frankfurt, and Nicosia last weekend then we wouldn't even be thinking about these questions right now. But they weren't, and we are. While I don't know how significantly confidence in the eurozone periphery's banks have been shaken by this week's events, I do have an idea of what I will be keeping an eye on over the coming weeks and months: deposits in banks in Greece and Spain. But if people around Europe's periphery start questioning the commitment of the ECB to banks in the periphery countries, and start considering that insured banking deposits are not actually risk-free if they happen to be in a bank in a southern European country, then it's possible that depositors may start moving their assets out of those banks. 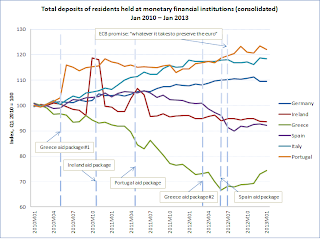 Deposits in the already weak banking systems of Spain and Greece seem to me the most likely to be at risk. While there's no reason to expect a sudden rush for the exits in those countries, it may not be unreasonable for people to believe that a €100.000 deposit in Deutsche Bank or ING might be a bit safer than the same deposit in Banco Popular or Pireaus Bank. So why not shift some of that money, just to be on the safe side, before the next crisis hits the eurozone? A gradual shift of deposits out of Spain and Greece could spell trouble for those banks, even if the shift is well short of what could be called a bank run. 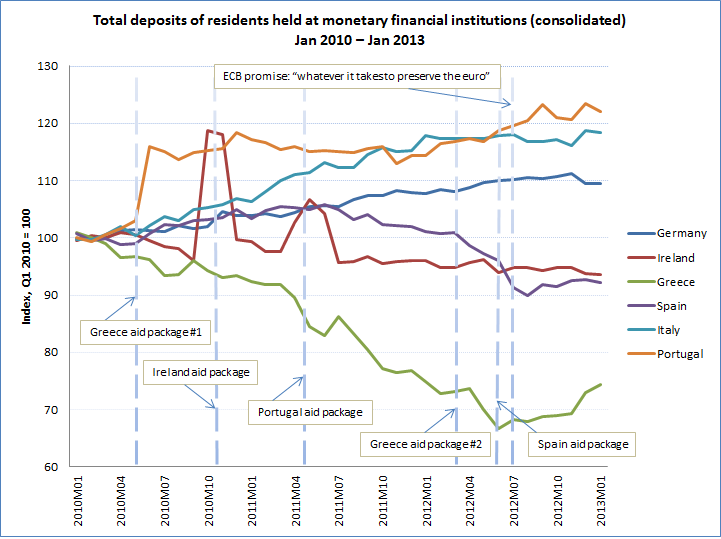 As the chart above illustrates, Spain and Greece s saw their banks' deposits steadily leaving town during 2011 and the first half of 2012. However, bank deposits in both countries stabilized in recent months, ever since the ECB's unequivocal statement in July 2012. If people interpret this week's events as undermining that crucial statement by the ECB last July -- an interpretation that I certainly wouldn't argue with -- then we may expect to see the negative trend in peripheral bank deposits resume. And with it the periphery's banking problems may resume as well. The big economic news of the week was, in fact, big economic news: the Fed's announcement of significant changes from past practice in the the quantity of its next round of large scale asset purchases ("unlimited"), and in the timing of any future reversal of this expansionary policy ("a considerable time after the economic recovery strengthens"). I view this as a pretty fundamental shift in how the Fed hopes to affect the economy. Rather than trying to push economic activity one way or the other through its management of interest rates (which can alter economic activity through its portfolio-rebalancing and wealth effects, for example), the Fed is now quite explicitly trying to affect economic activity by altering interest rate and inflation expectations. As Krugman has put it, the crux of the matter here is that this is pretty close to a "credible promise to be irresponsible". This is ground-breaking stuff for a central bank. This type of expectations-management hasn't really been done before -- at least not as an expansionary policy in a zero-lower-bound environment. And that is why I think that this could only have happened with an academic as Fed chair. There's a vast academic literature on the channels of monetary policy transmission (important bits of it written by Ben Bernanke himself), and a growing body of academic evidence that suggests that monetary policy's biggest impacts may often be through changing expectations. Woodford's already-famous August 2012 paper summarizes and crystalizes much of the current thinking on this subject, but the evidence and literature on the expectations channel has been steadily building for more than a decade. But despite this, it's hard for me to imagine Alan Greenspan, or any Greenspan-like Fed Chair who has primarily a Wall Street background, enacting such significant changes in how monetary policy is conducted purely on the basis of a body of academic research, without prior experience or Wall Street conventional wisdom to fall back on for support. The academic literature is often theoretically and mathematically complex, and employs statistical techniques that are pretty opaque to most people -- sometimes even to other economists. So unless you're immersed in the field yourself, it would take a pretty big leap of faith to set a new course for monetary policy based solely on the arguments and evidence in such papers. But Bernanke is immersed in the field. And so he is in a position to fully understand -- and perhaps more importantly, to really believe -- the conclusions of the academic literature, and therefore to allow that literature to guide the Fed's actions, even though its conclusions have not yet had time to become received wisdom in the financial world more broadly. And in the current situation, that may make all the difference. Sometimes a deep understanding of markets and institutions -- such as what one might gain from working on Wall Street -- is probably most helpful to running a central bank. (Think 2008, for example.) But at other times, an academic background can give a Fed Chair profound advantages. I do not think we would have seen this relatively rapid and remarkably direct implementation of the policy recommendations of academic papers if the Fed Chair had been anyone other than an academic himself. And with just a little bit of luck, we'll soon have more evidence about whether the academic literature was right. Another jobs report in the US, another month where part of the private sector's job creation was undone by continued job destruction by the government sector. The 15,000 additional jobs lost in April brings total job losses in the government sector since January 2010 to over 500,000. While the US has not quite been experiencing European-style austerity over the past two years, that's still a pretty tough headwind to fight as it emerges from recession. Europe is on its way back into recession. During the second half of 2011 several EU countries already met the most common definition of recession, namely two consecutive quarters of falling output, including Spain, Italy, the Netherlands, Denmark, Ireland, Greece, Cyprus, Czech Republic, Portugal, Slovenia, and the UK. Correspondingly, European unemployment rates began rising again during 2011, more than undoing the modest recovery they enjoyed in 2010. But while the prospect of a European recession in 2012 is quite bad enough, this understates the scope of the problem. Because not only will this year's recession directly impact millions of unemployed and soon-to-be unemployed EU workers, as well as (for those more fiscally minded) seriously damaging this year's government budget balances, it will have lingering effects on Europe's economies for many years to come. Hysterisis is the notion that the state of the world today has lingering effects on the future. In the context of labor markets this primarily arises because the state of being unemployed tends to make it harder for workers to find a new job, and the longer someone is unemployed the harder it becomes. Unemployment -- especially long term unemployment -- therefore has permanent negative effects on an economy even after economic growth has resumed. Unemployment today damages the economy's potential tomorrow. This should be of particular concern for European policy makers, because the European labor markets have proven to be particularly slow to recover from recessions. To get a rough sense of this, I calculated the weighted-average annual unemployment rate of what I call the "EZ6" -- the six largest eurozone economies, i.e. Germany, France, Italy, Spain, Netherlands, and Belgium -- over the past 20 years. If we compare the EZ6 unemployment rate with real GDP growth over those years, we find that every percentage point of real GDP growth reduces the unemployment rate by about 0.33 percentage points. In other words, for every percentage point that the unemployment rate goes up in the EZ6 this year, those economies will need three years of real GDP growth 1.0% above trend to undo the damage. This is significantly longer than in the US. For the US, every percentage point of real GDP growth causes the unemployment rate to fall by almost 0.5 percentage points, meaning that it takes about two years of growth that is 1.0% above trend to undo a one point rise in the unemployment rate, rather than three. The following chart shows the fall in unemployment rates after the past three recessions in the US. Unemployment rates have been normalized in each case so that the peak rate of unemployment is set equal to 100. Somewhat surprisingly (at least to me), the current unemployment recovery in the US is roughly on par with the previous two recessions. Granted, those previous two recessions were also characterized by frustratingly slow improvements in the labor markets (so presumably we should still hope to do better), but it's nice to be able to place our unhappiness with the present labor market recovery in some context. The next picture shows the same thing for the EZ6, and makes clear that unemployment increases in the eurozone tend to be considerably more sticky. Sometimes, it appears, what goes up comes down only very, very slowly. Even during the relatively successful recovery of 2005-2008 the EZ6 unemployment rate only dropped to about 81% of its peak. To be fair, it's important to recognize that unemployment rates also tend to rise more slowly in Europe than in the US. In 2009, for example, the unemployment rate in the US rose by 3.5 percentage points, while in the EZ6 the unemployment rate only rose by 1.6 pp. However, this doesn't take the sting out of the fact that when unemployment rates do rise in the eurozone -- as they are doing now -- their negative repercussions last considerably longer than in the US. European policy-makers need to remember this fact. Their misguided fixation on austerity as the solution to the eurozone's crisis has done a lot to push Europe back into recession. But importantly, the damage and pain caused by this will not just be felt in 2012, but rather for many years to come. Furthermore, this considerably increases the likelihood that expansionary fiscal policy (i.e. tax cuts and/or more government spending) in Europe would actually pay for itself and reduce government debt burdens in the long run. DeLong and Summers (pdf) recently expounded on this idea and illustrated how fairly reasonable parameter values -- at least in today's economic environment in the US -- can result in such an unconventional outcome. But if hysterisis effects can cause expansionary policy to be debt-reducing in the US, this must be all the more true for the eurozone given the sluggishness of its labor markets. Every additional drop of austerity added to the eurozone's economic brew this year will, more than likely, not only worsen the European Recession of 2012, but will also worsen the eurozone's long run budget picture. This week the Economist places François Hollande, the socialist presidential candidate who is likely to win the election in France on May 6, on its cover with the headline "The rather dangerous Monsieur Hollande". A socialist in charge of Europe's second-largest economy is apparently cause for serious concern. But why? France is overburdened with a massive welfare state and needs to make changes, argues the Economist: "Public debt is high and rising, the government has not run a surplus in over 35 years, the banks are undercapitalised, unemployment is persistent and corrosive and, at 56% of GDP, the French state is the biggest of any euro country." But looking at the data, France actually does not seem to be doing particularly badly. A look at a few basic economic indicators over the past ten years fails to reveal any obvious signs of an economy that has been oppressed by an oversized government sector, as seen below. Yes, the French have chosen to allow the government to perform more functions than in many other countries, but economic growth has not been notably worse than its neighbors, and its public debt burden is on par with Germany and the United Kingdom. Despite ideological wishes to the contrary, there is little evidence that countries that choose to have a larger government (within a reasonable range) perform worse economically. Hollande's chief sins are, according to the Economist, that he advocates a very high top income tax rate, that he supports a suspension of a planned increase in the retirement age for those who have contributed the longest to the nation's pension fund, and that he has a generally "anti-business attitude". But it's hard for me to see how any of this could spell doom for the French economy. And on the other side of the ledger, Hollande has something extremely important to recommend him to those who care about European economic performance: a potentially strong voice against the counterproductive austerity madness that has dominated eurozone politics for the past couple of years. The tide may be turning more widely in the battle for the eurozone's macroeconomic sensibilities; perhaps the steady repetition by certain prominent voices of the simple truth that austerity is counterproductive under current circumstances may finally be bearing some fruit. But if Hollande becomes France's president, the relative weight of the anti-austerity camp will grow considerably in the eurozone. And that can only mean good news for the future of the eurozone. Won't eurozone bond markets be spooked by Hollande's softness on deficits, though? I doubt it. I tend to think that bond market participants are, on average, quite savvy. And they fully understand (probably quite a bit better than a lot of politicians do) the arguments for why pro-growth policies are the best ways to restore long run fiscal health to eurozone (and other) economies. Instead of causing fiscal armageddon, expansionary fiscal policies could actually reduce national debt burdens in most eurozone countries, given present circumstances. So rather than be afraid of things like a possible Hollande victory, or the collapse of the conservative, austerity-promoting government of the Netherlands, I actually see such developments as reason for the slightest bit of (cautious) optimism. The eurozone crisis is and always has been primarily a balance of payments crisis, not a fiscal crisis. So if we are finally nearing the end of the disasterous blanket prescription for austerity as the solution to the eurozone's financial market crisis, that can only be a good thing. In 2011, the government deficit of both the euro area2 (EA17) and the EU27 decreased in absolute terms compared with 2010, while the government debt rose in both zones. In the euro area the government deficit to GDP ratio decreased from 6.2% in 20103 to 4.1% in 2011, and in the EU27 from 6.5% to 4.5%. In the euro area the government debt to GDP ratio increased from 85.3% at the end of 2010 to 87.2% at the end of 2011, and in the EU27 from 80.0% to 82.5%. During 2011 the borrowing requirements of the eurozone's governments fell by about €180bn, of which nearly 60% was accounted for by the two largest economies, France and Germany. But expressed as percent of GDP, it was the countries that have been forced to implement tough austerity measures that were at the top of the deficit reduction list between 2009 and 2011. The following table illustrates. Greece, Portugal, and Spain have substantially reduced their deficits over the past two years, despite the fact that their economies were stagnant or contracting. And of course, their terrible economic performance can be attributed in large part precisely to those very same austerity measures, as contractionary fiscal policy in each country has depressed their economies. Yet eurozone politicians' obsession with deficit reduction continues -- and continues to have new repercussions every day on the eurozone's economies and governments.